Oh boy, as if the homestead's not had enough redheaded trouble lately, we've got another one on the way, and this one has some real naughty potential! Whereas last week's fiery-bonced tornado was from Ted's side of history, this week it's Bess' side... and specifically her Niece, Sarah. 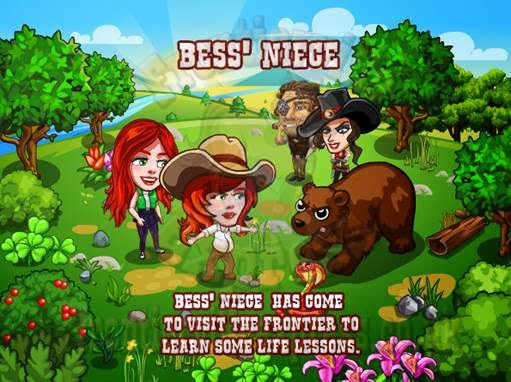 Bess' Brother has reached his wits end with his daughter so has sent her out to Bess to take her in hand, teach her some life lessons and toughen her up... Well, I SAY Bess but what has one finger and is about to be lumbered with dealing with a ginger teenager? *Points at self*. That kicks off a fairly standard 5 mission set with a wrapper and a Monday mission (all details HERE) but a slightly non-standard build as instead of one, we get two... (all details HERE). The first is a more traditional build, the Etiquette Desk. The second is Sarah herself, who will change depending on the storyline and isn't a full build, just a couple of tasks each time. Other than that the missions are fairly standard, one addition is we'll be seeing a new injured animal, Chores, which is tended with just 6 Honest Work, which is a wall post item. That then becomes one of three types, one of which is needed for the mission. So, let's put our most mature faces on, and try and get this teen flying right!